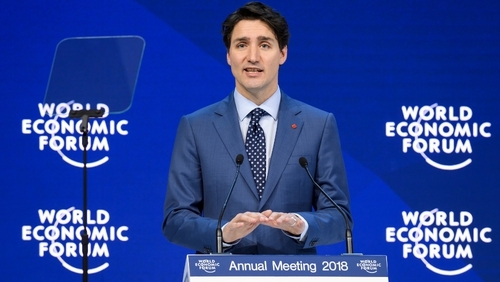 Canadian Prime Minister Justin Trudeau gave a passionate defence of gender and social equality in Davos, days before US President Donald Trump was due to take the stage at a forum traditionally seen as an enclave of the global elite. Mr Trudeau, whose country has the presidency of the Group of Seven industrialised nations this year, said gender equality would be a priority in "everything the G7 does this year". Mr Trudeau, who appointed a cabinet with an equal number of women and men on taking power in 2015, also referenced social media campaigns against sexual harassment and misconduct and women's marches in several US cities last weekend in which speakers blasted Mr Trump for policies they said had hurt women. "MeToo, TimesUp, the Women's March, these movements tell us that we need to have a critical discussion on women's rights, equality and power dynamics of gender," said Mr Trudeau. The movements sprang up after a string of scandals involving powerful men in Hollywood, Washington and elsewhere. "Sexual harassment for example, in business and in government, is a systemic problem and it is unacceptable. As leaders we need to recognise and to act to show that truly time is up," he said. Over the past two years, more than a dozen women have accused Mr Trump of making unwanted sexual advances against them years before he entered politics. Mr Trump has denied the accusations, and the White House has accused the women of lying. Since the 2016 presidential campaign, Mr Trump has had sharply lower approval ratings among women than among men. A Pew Research Center poll in May showed 46% of men approving of Mr Trump’s job performance, while only a third of women did. Mr Trudeau also called on global leaders to not forget "the people who aren't here in Davos and never will be". "The people in this room are immensely privileged. We owe it to society to use this privilege for good. We should ask ourselves: do we want to live in a world where the wealthy hide in their gated enclaves while those around them struggle or do we want to create a world grounded in the notion of fairness." In his speech on Friday, Mr Trump is expected to urge investors to take advantage of his deregulatory and tax cut policies, which his Democrat opponents describe as a giveaway to the wealthy which will widen the income gap between rich and poor. Mr Trump signed sweeping tax legislation into law last year, in a bill that slashes taxes for corporation and the wealthy while giving mixed, temporary tax relief to middle-class Americans. Thousands of anti-capitalist protesters marched through Zurich and other major Swiss cities to demonstrate against Mr Trump’s visit to the WEF. Leftist organisers had called for protests under the mottos "Trump Not Welcome" and "Smash WEF!" Flag-waving demonstrators, whom Zurich police estimated at 2,000, carried anti-globalist and environmentalist placards such as "No Trump, no coal, no gas, no fossil fuels" as they marched toward Zurich's financial district, where bankers had been warned to stay clear of the approved demonstration. Similar protests took place, with several hundred protesters each, in public squares in Geneva, Lausanne and Fribourg. Earlier in Geneva, protesters laid a wreath at the entrance of the US diplomatic mission in memory of Heather Heyer, who was killed in Charlottesville, Virginia amid clashes between hundreds of white supremacists and counter-protesters last August. After the rally, Mr Trump inflamed tensions by saying there were "very fine people" on both sides, drawing condemnation from some Republican leaders and praise from white supremacists. Earlier this month, demonstrators also protested against Mr Trump's visit in the Swiss capital of Bern. That march went off peacefully, unlike violent anti-WEF protests in several Swiss citities in the early 2000s. More than 4,000 Swiss soldiers have deployed to guard Davos alongside 1,000 police, while a no-fly zone was put in place to protect delegates. Protectionism is gaining ground and globalisation is losing its appeal, but India is open for business, Indian Prime Minister Narendra Modi has told the WEF. Mr Modi is leading a big government and business delegation to the summit in Davos, the first Indian prime minister do so in 21years. "Instead of globalisation, the power of protectionism is putting its head up. Their wish is not only to save themselves from globalisation, but to change the natural flow of globalisation," Mr Modi said at the opening of the forum. More than 70 heads of state and government are attending the summit, including Taoiseach Leo Varadkar, as well as chief executives and top bankers. "The result of this is that we are seeing new types of tariff and non-tariff-based barriers being imposed. Bilateral and multilateral trade negotiations appear to have come to a halt. "There is a slowdown in cross-border financial investments and the expansion of (the) global supply chain appears to have slowed down." Mr Trump has been pushing an "America First" policy of getting businesses to invest in the United States instead of overseas, potentially affecting the growth prospects of emerging economies such as India dependent on foreign investment. During his 2016 election campaign, Mr Trump blamed globalisation for ravaging US manufacturing jobs as companies sought to reduce labor costs by relocating to Mexico and elsewhere. Mr Trump is due to address the forum on Friday. He will also meet Israeli Prime Minister Benjamin Netanyahu, Rwandan President Paul Kagame and other world leaders at the form. He will not a small dinner for European business executives on Thursday night, White House economic adviser Gary Cohn said.